Primavera (new life) is the Italian word for spring. 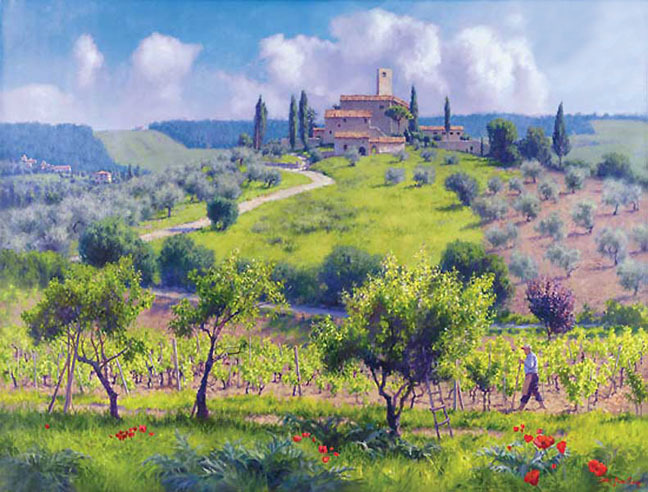 It is Maggio (May) in this Tuscan scene, the poppies have begun to bloom and every tree, vine and flower is full of new life. The young artichokes have come up again on their own, among the grasses and fiori (flowers) of spring. The gardener tends the new growth on the vineyards, wearing the traditional leather apron and heavy boots.